"Our KaBOOM! playground was built by over 200 members of our community including our school families. 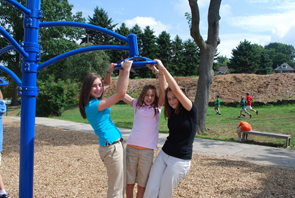 The playground is used every day during the school year by 3rd-8th graders, approximately 200 children. One of our goals in building the playground was to increase the amount of exercise the middle-school children were getting. They did not play on the old playground. The new Evos™ playground has provided the right kind of developmental challenge for all of the students. We now see regular use of the playground by the middle schoolers and the equipment has held up wonderfully. In addition to the increased usage of the playground by middle schoolers, the younger children love the new playground and spend as much time as they can playing on it. "There are multiple ways to play on this playground, and we have seen children experimenting, trying new skills, and teaching each other. Our kindergarten and first graders use a smaller playground and they all can’t wait to 'graduate' to this playground. It is seen as a status symbol of their maturity, as well as a wonderful place for them to play. 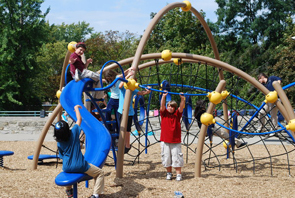 "In addition to daily recess, our playground is used for afterschool care during nice weather. After school on any given day you will find children begging their parents to let them go play on the playground before leaving. "When we host extracurricular sporting events on our fields, siblings swarm to our playground. When we plan any events at school outside of the school day, we plan playground time for children attending and have volunteers always available to supervise. If the weather is nice, we don’t need to plan any other activities for children at events because all they want to do is play on the playground. "When we had our previous playground, the school budgeted to replace the wood fiber every other year and that schedule never provided a problem. However, with the new playground, there is much greater use, and thus the unexpected consequence of needing to replace the surfacing more frequently. Now that the school realizes the positive impact of the playground and its related consequences, the administration is budgeting for appropriate additional wood carpet in future years. The playground has had such a positive impact that the school is looking at ways to involve the community every year in building, funding, and maintenance. Last year when we replaced wood fiber we had a community 'mulch spreading day.' We encouraged people to come in old clothes and bring their own tools. We provided the coffee, donuts, and wood fiber!" Learn more about this playground on the KaBOOM! Playspace Finder.